The San Jose Harvest Festival, which took place November 27-29 this year at the San Jose Convention Center, brought in large crowds eager to shop with their families after Thanksgiving. The festival took place on Black Friday weekend, encouraging Christmas shoppers to buy from small businesses and local artisans instead of flocking to major malls. The Harvest Festival, one of the top rated craft shows in the United States, featured over 24,000 handmade items. Attendees were able to meet the makers face to face while browsing unique art, jewelry, clothing, toys, home decor, and more. 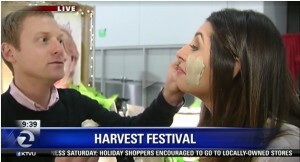 On Saturday, November 28, the San Jose Harvest Festival was specially featured by KTVU Fox 2 News. For three and a half hours, KTVU toured the area, interviewing vendors and granting viewers an inside look at the Harvest Festival’s diverse handmade crafts, art, and specialty foods. KTVU highlighted a number of vendors, including Bruce Lanham Scrimshaw, which specializes in beautiful engravings in swordfish bone. Another shop, Cherry Country from Oregon, showed off delicious dried fruit, jams, and chocolate covered cherries. KTVU also spoke to Frank Vigneri of Candle Opera, who displayed his beautifully designed candle holders created from thin wood veneer. Personalized home decor and ornaments were available from Mosaics by Sharice, a new vendor to the Harvest Festival, and Mississippi Miracle Clay even gave the KTVU reporter an on-air facial using their unique southern face mask. The Harvest Festival wasn’t only about the products for sale, though. Le Jazz Hot Trio supplied lively music for the Festival, delighting attendees and continuing a tradition of fine French Gypsy Jazz. James Garner’s Tribute to Johnny Cash also charmed audiences, faithfully recreating Cash’s biggest hits. Sausages, salads, sandwiches, coffees, and more were available for attendees to enjoy a delicious lunch while enjoying the entertainment.